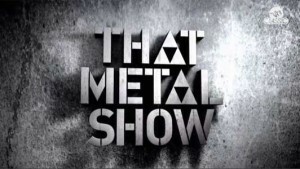 With Season 14 of “That Metal Show” already making history (the Season 14 premiere was the second most watched Season Premiere in the history of the series) VH1 Classic’s centerpiece in original programming makes history again with its most diverse lineup of guests since the show began. This week’s show features legendary punk drummer Marky Ramone of the Ramones, Hip-Hop’s “King Of Rock” Darryl “DMC” McDaniels of Run DMC, and thrash forefather and guitar hero Gary Holt of Exodus/Slayer. The episode also features Whitesnake’s new guitarist and TMS alum Joel Hoekstra making his return to “That Metal Show” as the guest musician. Joel dazzles the crowd with his incredible playing abilities and gives us some insight about the upcoming new Whitesnake record called The Purple Album slated for release on May 19th. Whitesnake singer and longtime friend of the show David Coverdale checks in via the “Metal Modem” from the recording studio where he is presently laying down the final tracks for The Purple Album. I think it is a little unfair to suggest “the beginning of the end of the show”. So what if it was? The show has been around for 14 seasons! I don’t like “every” guest, but I will say the following: (1) there have been guests of bands I particularly don’t like in episodes that I still thought were entertaining for one reason or another, (2) the podcasts support the same sentiment even moreso; where the interviews are extended and very well done despite my level of interest for that particular artist, and (3) you have to take the guest list with a grain of salt given a lot of the artists that would be nice to have on the show either have declined, other engagements, or are not “classic” by VH1 standards. That all said – Armored Saint is on next week for the first time! Having them as a guest epitomizes what we hope for and cannot always happen, so embrace the upcoming show and enjoy! I agree with Todd about Armored Saint being guests on That Metal Show. I never would have expected them to be on it, but it is a great, pleasant surprise. Hopefully, their visit to the Show will help promote them as the great heavy metal band they truly are and give them some well deserved notoriety that has been a long time coming. TMS is MUST see TV for me. I also really like how Rock Icons comes on right after it. Great pairing! I actually thought McDaniels came across as a class act on the show and he seems to love metal so it was kind of cool. That being said, old school hard rock and metal get no radio airplay or publicity from the mainstream these days, so I prefer TMS to interview people who get ignored these days. I still would like to see Doro Pesch back on the show again and given a little more time. If TMS is going to go more mainstream, what about Billy Idol? He has a new album out and biography that are great and tons of hits in the 80’s. We have asked Idol. I don’t think people realize how much more is involved in booking a guest than just saying “how about_____”. Thanks for watching!